South Kensington is an affluent district of West London in the Royal Borough of Kensington and Chelsea. With some of its easterly areas shared with the City of Westminster, the district is known as a popular tourist destination due to its density of museums and cultural landmarks. Neighbouring the equally affluent centres of Knightsbridge, Chelsea and Kensington, South Kensington covers some of the most exclusive real estate in the world. It is home to large numbers of French expatriates (mainly employed in the City, the financial centre), but also Spanish, Italian, American, and Middle-Eastern citizens, as well as a significant number of celebrities. A significant French presence is evidenced by the location of the consulate, the Lycée Français Charles de Gaulle – a large French secondary school opposite the Natural History Museum – and the Institut Français, home to a French cinema. There are several French bookshops and cafes in the area and is even sometimes referred to as Paris’s 21st arrondissement. In 1863 it was decided that the Church of England parish of Kensington should be divided up, and the parish of South Kensington was created, the parish church being St Stephen's (built 1865) on the corner of Gloucester Road and Southwell Gardens. Oscar Wilde (1854-1900), poet, playwright and wit, lived with his wife and children at 34 Tite Street (then 16). Beatrix Potter (1866–1943), author and artist, spent her early life in Bolton Gardens. Dennis Gabor (1900–1979), electrical engineer and physicist, most notable for inventing holography, 1971 Nobel Prize in Physics. Lived in No. 79, Queen's Gate. Peter Finch (1916–1977), English-born distinguished Australian actor, won 5 BAFTA acting awards and he was the first person to win a posthumous Academy Award in an acting category. 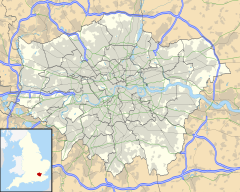 Wikimedia Commons has media related to South Kensington.